David Bowie contributed vocals to Arcade Fire's new single "Reflektor," the veteran singer has confirmed. 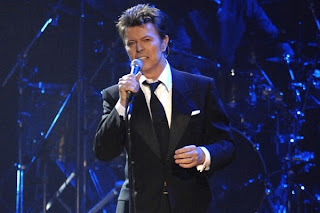 Bowie's official Facebook page said he "supplied a brief backing vocal on the James Murphy (LCD Soundsystem) produced track," which will be available as a two-track 12-inch vinyl release credited to The Reflektors that also includes an instrumental version of the song. Arcade Fire released an interactive video for "Reflektor" yesterday, in addition to the previously announced video by director Anton Corbjin, after a teaser campaign featuring guerilla graffiti art and cryptic announcements. The band is set to perform on the season premiere of Saturday Night Live on September 28th, and their new album is due out on October 29th.